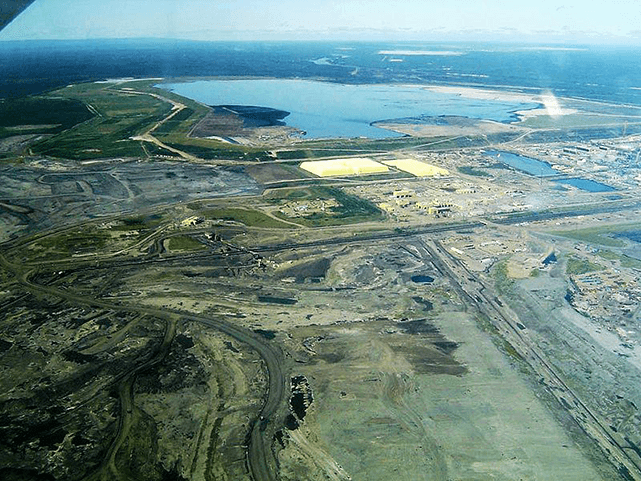 Canada’s oil sands are a microcosm of all the challenges the carbon sector faces today. And it’s one that investors around the world need to look at to get a perspective on what might be happening to the hydrocarbon resources buried in their own portfolios. It wasn’t that long ago that Prime Minister Stephen Harper started heralding the transformation of Canada into an energy superpower. The billions of barrels of oil held in Alberta’s oil sands – the world’s third-largest proven oil reserve – and its close proximity to the huge American energy market looked like a can’t-lose proposition for Canadian suppliers. Production soared from a couple of hundred thousand barrels a day to over a million. Royalty revenues poured into the Alberta Treasury – so much so that the Alberta government thought nothing of spending millions on a public relations campaign to change the nomenclature of the province’s treasured resource from “tar” sands to the much more benign-sounding “oil” sands. Meanwhile, share prices of oil sands producers soared, along with new underwritings, making the sector a darling of the big investment banks and the Toronto Stock Exchange (TSX). How quickly the world has changed for Alberta’s oil industry. What was once seen as the nation’s most important economic asset looks today more like a liability. And the only thing that the development of the oil sands has transformed Canada into is an environmental pariah, viewed by the rest of the world as oblivious to the challenge of global climate change. But it’s not just Canada’s international image that the oil sands have tarnished. Much worse is what the resource has done to investors lately. Suddenly the market is eschewing the crown jewels of Canada’s energy assets. The reason is simple enough and bedevils much of the newfound production in North America. Pipeline capacity has failed to keep pace with production, creating costly transportation bottlenecks that have severely restricted market access, forcing deep price discounts from Alberta’s oil producers. Western Canadian Select, the benchmark price for Alberta’s heavy crude, ranks among the cheapest oil globally. It trades as much as $40 a barrel below the U.S. benchmark price, West Texas Intermediate, and at times over $50 less than the global benchmark price, Brent. Unfortunately for Alberta producers, those depressed selling prices are coupled with some of the highest cost structures of any hydrocarbon resource on the planet. The oil sands rank as one of the most expensive energy resources, according to a Citibank analysis, which looks at 300 of the world’s largest oil and gas projects. As noted in a recent report by Carbon Tracker, estimates for break-even oil prices on new Canadian oil sands projects range from $80 to $100 per barrel based on reports from Goldman Sachs, Wood Mackenzie and IHS CERA. Those kinds of costs are challenging enough on their own, but when you consider that producers only get a fraction of global oil prices, the picture starts looking pretty grim. In recent years those dismal economics have rendered the tar patch a graveyard for investors. The sector has lost more than half its market capitalization since the last recession using BlackRock’s iShares Oil Sands Index as a benchmark (i.e., a basket of all the major TSX-listed oil sands players including Suncor, Cenovus, Canadian Natural Resources, Imperial Oil and Canadian Oil Sands). Once a dynamic driver of the TSX, the energy sector has become a drag on index performance. Indeed, at a 25 per cent weighting in the index, the sector represents a very significant drag that even passive index investors have had to bear. Investors shouldn’t expect it to get better. The sector’s profitability – let alone its grandiose plans to more than double production by 2030 – hinges critically on solving the market access problem and busting the so-called bitumen bubble. Unless Western Canadian Select can materially close that huge price gap with the U.S. and global benchmark prices, revenues will be severely challenged to cover rising costs, leaving investors increasingly reluctant to finance the enormous capital expenditures needed to continually grow production. The capital investment required to ramp up oil sands production to the industry’s target of five million barrels a day is staggering in scale. According to the Conference Board of Canada, the required investment spending will run well north of $300 billion. That scale of capital isn’t going to flow into new production without the infrastructure to move all that oil to markets and dramatically improve pricing for Alberta producers. But that infrastructure looks nowhere in place. Even if President Barack Obama were to ultimately approve TransCanada’s Keystone XL pipeline, the 700,000-plus barrels a day it would move from Alberta to the U.S. Gulf Coast (keeping in mind 100,000 barrels a day is reserved for Bakken oil producers in North Dakota) is only a fraction of the pipeline capacity needed to realize the industry’s production targets. It would take a whole network of new pipelines running from coast to coast, including Enbridge’s proposed Northern Gateway line to the Pacific Ocean and TransCanada’s proposed Energy East pipeline to the Atlantic, to provide the kind of pipeline capacity needed to accommodate the massive ramp-up in production that is planned. But pipelines to carry bitumen from the oil sands are no more popular on the Canadian side of the border than they have been on the U.S. side. That same transportation problem is equally vexing for oil producers in the prolific shale plays springing up across the United States. Just as the need for new pipelines in North America has never been greater, the politics of pipeline approval has never been more problematic. So far, rail has come to the rescue, providing a critical transportation role that hasn’t been seen in the oil industry since the early part of last century. In the U.S., over a million barrels a day of oil is being moved by rail, with some new areas of production, like the Bakkan, critically dependent on rail to get oil delivered to coastal refineries. Alberta producers are now similarly looking to railways to solve their transportation problems. Three oil-loading terminals are slated for construction in western Canada. All told, proposed new rail terminals across the country could facilitate as much as 900,000 barrels a day of oil moved across Canada by railcars. To put that number in perspective, it’s a larger flow of oil than even the yet to be approved Keystone XL pipeline would carry. Moving oil by rail is not only a more costly mode of transport than pipelines, but it is a far more hazardous one as well. We’ve already had one tragic derailment in Lac-Megantic, Quebec, and a number of close calls, including derailments near Calgary and Saskatoon and a derailment and subsequent explosion in rural Alabama. Start moving millions of barrels of oil across the continent and unfortunately the laws of probability dictate that there will be more accidents. If the next one happens to be near a major metropolitan area like Chicago or Toronto, it won’t be long before the lawsuits and soaring insurance premiums dampen railways’ appetite for hauling oil. Transportation issues, as pressing as they now are, are not the only problem faced by investors in oil sands stocks. Ultimately, their resource, which is one of the most emission-intensive oils extracted and refined anywhere in the world, faces an even bigger risk from carbon emissions. Today, investors in energy companies act as if there are no constraints on how much carbon the world can burn. Even in this bubble of climate change denial, the tandem of high costs and weak pricing power make the oil sands a losing proposition. But in tomorrow’s world of constrained carbon emissions, the sector’s future will be even more in doubt. According to the International Energy Agency, two-thirds of the world’s hydrocarbon reserves must be left in the ground in order to limit the rise in average global temperature to the 2-degree-Celsius threshold that climate scientists warn we must not cross. Considering their cost structure, poor pricing and the almost 20 per cent heavier carbon footprint than conventional oil, Alberta’s oil sands seem precisely the kind of stranded energy assets that the energy agency says we must leave in the ground. In tomorrow’s world of constrained carbon emissions, costs will become even more important than they are today in determining which hydrocarbon reserves get developed and which ones do not. Already facing marginal costs that are higher than the deeply discounted price of Western Canadian Select, the economics of production growth in the oil sands is simply unsustainable. The huge capital expenditures needed to expand production, which continues to flow, are incompatible with the crashing returns on investment in the sector. Investors would be much better served if oil sand producers paid out their cash flow in dividends or used it for share buybacks than pouring ever more capital into expanding, unprofitable production. If management can’t figure that out, chances are shareholders will.